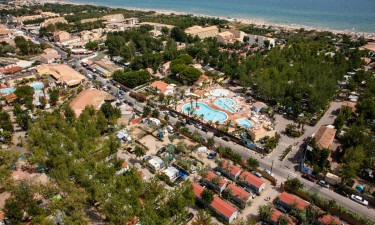 Located between the flourishing greenery of Thau lake (where you can see flocks of flamingos) and one of the most beautiful beaches of Languedoc, Les Méditerranées Charlemagne camping site and resort offers a camping holiday to remember. The Charlemagne camping village resort area also has top quality services. If you have already decided to stay with Lux-Camp at this luxury camping park and would like to make your reservation, please get in touch. What does Les Méditerranées Charlemagne camp site offer? Les Méditerranées is ideal for families and adults who appreciate luxury and comfort. As well as relaxing in the warm Mediterranean sunshine, group exercise classes are offered including sea walking, aqua bike, water aerobics and Zumba dancing. Alternatively, the Beach Club’s Nouvelle Floride area organises activities and has a festive atmosphere. There is also a kids’ and youth club, in addition to a water park with paddling pool – with new water slides planned for the 2015 season. Electrical power is connected to your mobile home. Les Méditerranées offer its visitors free access between the beach club with its curved lagoons and the beach garden facilities. Lux-Camp luxury camping site also provides bungalow tent and luxury tent accommodation; please bear in mind that camper vans and visitors’ tents are not permitted at this location. The nearby sand beach is long, wide and ideal for swimming, surfing and sailing; its shallow water access also offers safe bathing for children. Mosquito Beach has a beach bar serving food and cold drinks – here, boat hire and trips are available, as well as jet skiing. For those wishing to travel further afield, Montpellier is 70 kilometres to the northeast and about an hour’s drive on the A9 motorway, along the coast. It is the eighth largest city in France and the fastest growing – attractions you may wish to consider seeing include the aquarium, one of the museums, its French castles, impressive cathedral or the vineyard tours where you can see wine being produced. There is an on-site shop and a restaurant offering traditional local and international dishes and freshly cooked takeaway meals. Other shops and small supermarkets are situated nearby too.